Partitioned tables can be a quick and efficient way to (amongst other things) archive data. In the next couple of posts I will run through the basics of partitioning. Starting with setting up a partitioned table and loading some data. OK, so the first thing to do is create a partition function. This function defines the number of partitions we will intiailly have. It also specifies the boundaries of each partition. So this statement has said that my partition function is going to be using dates as boundaries. What I’ve done is setup a bunch of partitions for one week in the past and one week in the future. The function sets the right “side” of the partition as the boundary, basically specifying which side of the boundary value the partition extends. The best way of thinking about it is like this….. So in these partitions, the data in the partition is always less than the value of that partition’s boundary. The partition scheme maps the data to a partition function and specifies where the data is going to be stored. The [ALL TO (DEMO)] part of the statement says that all partitions are going to be mapped to the DEMO filegroup. Instead of specifying that the table be placed on a filegroup, the statement has [ON DemoPartitionScheme(CaptureDate)] at the end. 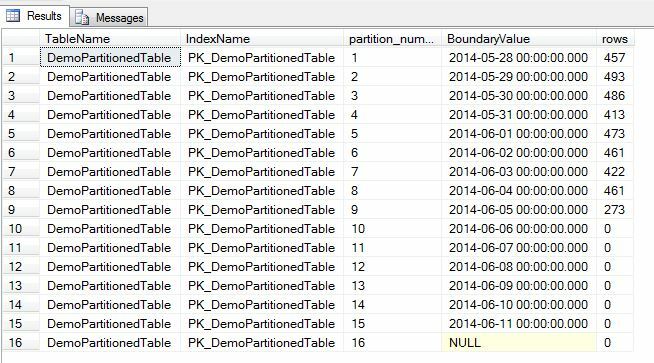 This means that the table is on the partition scheme, using the column CaptureDate to determine which rows go on which partition. Remember that the boundary values are the upper limit, no value in the partitions will match that value due to the partition function being specified as RANGE RIGHT. I’ll continue this post later in the month, when I’ll talk about creating new partitions and merging partitions. Hi Leon. Thanks for pointing that out. I’m used to always having a database called Demo in my local instance so did not spot that.